P. mirabilis on an XLD agar plate. Proteus mirabilis appears as Gram-negative rods after Gram staining under bright-field microscopy with 1000 times magnification. Ureases, functionally, belong to the superfamily of amidohydrolases and phosphotriesterases. Ureases are found in numerous bacteria, fungi, algae, plants, and some invertebrates, as well as in soils, as a soil enzyme. They are nickel-containing metalloenzymes of high molecular weight. An alkaline urine sample is a possible sign of P. mirabilis. 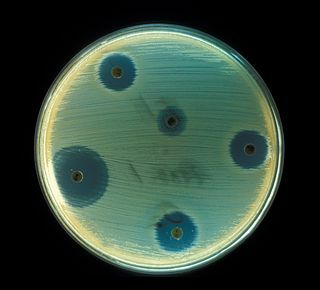 It can be diagnosed in the lab due to characteristic swarming motility, and inability to metabolize lactose (on a MacConkey agar plate, for example). Also P. mirabilis produces a very distinct fishy odor. Lactose is a disaccharide. It is a sugar composed of galactose and glucose and has the formula C12H22O11. Lactose makes up around 2–8% of milk (by weight). The name comes from lac (gen. lactis), the Latin word for milk, plus the suffix -ose used to name sugars. The compound is a white, water-soluble, non-hygroscopic solid with a mildly sweet taste. It is used in the food industry. Struvite (magnesium ammonium phosphate) is a phosphate mineral with formula: NH4MgPO4·6H2O. Struvite crystallizes in the orthorhombic system as white to yellowish or brownish-white pyramidal crystals or in platey mica-like forms. It is a soft mineral with Mohs hardness of 1.5 to 2 and has a low specific gravity of 1.7. It is sparingly soluble in neutral and alkaline conditions, but readily soluble in acid. P. mirabilis can use urea. It can produce hydrogen sulfide gas, and forms clear films on growth media. It is motile, possessing peritrichous flagella, and is known for its swarming ability. It is commonly found in the human digestive system. P. mirabilis is not pathogenic in guinea pigs or chickens. Noteworthy[ to whom? ] is the ability of this species to inhibit growth of unrelated strains, resulting in a macroscopically visible line of reduced bacterial growth where two swarming strains intersect. This line is named the Dienes line after its discoverer Louis Dienes. The guinea pig or domestic guinea pig, also known as cavy or domestic cavy, is a species of rodent belonging to the family Caviidae and the genus Cavia. Despite their common name, these animals are not in the pig family Suidae, nor do they come from Guinea in Africa, and the origin of their name is still unclear; they originated in the Andes of South America and studies based on biochemistry and hybridization suggest they are domesticated descendants of a closely related species of cavy such as C. tschudii, and therefore do not exist naturally in the wild. Indole is an aromatic heterocyclic organic compound with formula C8H7N. 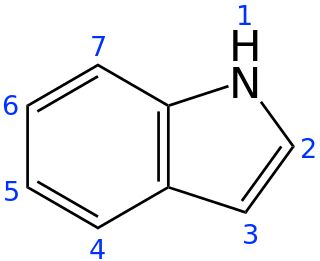 It has a bicyclic structure, consisting of a six-membered benzene ring fused to a five-membered pyrrole ring. Indole is widely distributed in the natural environment and can be produced by a variety of bacteria. As an intercellular signal molecule, indole regulates various aspects of bacterial physiology, including spore formation, plasmid stability, resistance to drugs, biofilm formation, and virulence. The amino acid tryptophan is an indole derivative and the precursor of the neurotransmitter serotonin. Nitrate reductases are molybdoenzymes that reduce nitrate to nitrite. This reaction is critical for the production of protein in most crop plants, as nitrate is the predominant source of nitrogen in fertilized soils. Methyl red, also called C.I. Acid Red 2, is an indicator dye that turns red in acidic solutions. It is an azo dye, and is a dark red crystalline powder. Methyl red is a pH indicator; it is red in pH under 4.4, yellow in pH over 6.2, and orange in between, with a pKa of 5.1. Murexide and methyl red are investigated as promising enhancers of sonochemical destruction of chlorinated hydrocarbon pollutants. Methyl red is classed by the IARC in group 3 - unclassified as to carcinogenic potential in humans. The urea breath test is a rapid diagnostic procedure used to identify infections by Helicobacter pylori, a spiral bacterium implicated in gastritis, gastric ulcer, and peptic ulcer disease. It is based upon the ability of H. pylori to convert urea to ammonia and carbon dioxide. Urea breath tests are recommended in leading society guidelines as a preferred non-invasive choice for detecting H. pylori before and after treatment. Cefazolin, also known as cefazoline and cephazolin, is an antibiotic used for the treatment of a number of bacterial infections. Specifically it is used to treat cellulitis, urinary tract infections, pneumonia, endocarditis, joint infection, and biliary tract infections. It is also used to prevent group B streptococcal disease around the time of delivery and before surgery. It is typically given by injection into a muscle or vein. Antibiotic sensitivity or antibiotic susceptibility is the susceptibility of bacteria to antibiotics. Because susceptibility can vary even within a species, antibiotic susceptibility testing (AST) is usually carried out to determine which antibiotic will be most successful in treating a bacterial infection in vivo. Testing for antibiotic sensitivity is often done by the Kirby-Bauer method. Small wafers containing antibiotics are placed onto a plate upon which bacteria are growing. If the bacteria are sensitive to the antibiotic, a clear ring, or zone of inhibition, is seen around the wafer indicating poor growth. Other methods to test antimicrobial susceptibility include the Stokes method, Etest, Agar and Broth dilution methods for minimum inhibitory concentration (MIC) determination. The results of the test are reported on the antibiogram. Mycobacterium cosmeticum is a rapidly growing mycobacterium that was first isolated from cosmetic patients and sites performing cosmetic procedures. Providencia rettgeri, is a Gram negative bacterium that is commonly found in both water and land environments. P. rettgeri is in the genus Providencia, along with Providencia stuartii, Providencia alcalifaciens, and Providencia rustigianii. P. rettgeri can be incubated at 37 °C in nutrient agar or nutrient broth. It was first discovered in 1904 after a waterfowl epidemic. Strains of the species have also been isolated from nematodes of the Heterorhabditis genus. Achromobacter xylosoxidans is a Gram-negative, aerobic, oxidase and catalase-positive, motile bacterium with peritrichous flagella, from the genus Achromobacter. It is generally found in wet environments. Achromobacter xylosoxidans can cause infections such as bacteremia, especially in patients with cystic fibrosis. In 2013, the complete genome of an A. xylosoxidans strain from a patient with cystic fibrosis was sequenced. Corynebacterium urealyticum is a bacterial species of the Corynebacterium genus. It is not commonly found in healthy people. It is, however, an important isolate when found in conjunction with a urinary tract infection. In contrast to acid-producing bacteria like Escherichia coli, C. urealyticum, as the name implies, secretes urease enzyme which is strong enough to make urine alkaline. This can lead to the formation of struvite calculi or renal stones. Risk factors associated with this bacterium include immunosuppression, underlying genitourinary disorders, and antibiotic therapy. There are other urease-producing corynebacteria that are associated with urinary tract infections, but C. urealyticum is the most common. Bacillus fastidiosus is an aerobic, motile, rod-shaped bacterium that has been isolated from soil and poultry litter. The species was first isolated and described by the scientist Den Dooren de Jong in 1929. This organism is a mesophile that contains ellipsoidal spores that do not cause swelling of the sporangia. Bacillus fastidiosus is only able to grow in the presence of uric acid, allantoin, or allantoic acid. ↑ Proteus mirabilis and Urinary Tract Infection . ↑ O'hara CM, Brenner FW, Miller JM. Classification, identification, and clinical significance of Proteus, Providencia, and Morganella. Clin Microbiol Rev. 2000;13(4):534-46. .
↑ Gonzalez, Gus; et al. "Proteus Infections Medication". Medscape. Retrieved 30 October 2015. Esipov, Sergei E.; Shapiro, J. A. (1998). "Kinetic model of Proteus mirabilis swarm colony development". Journal of Mathematical Biology. 36 (3): 249–268. doi:10.1007/s002850050100. Frénod, Emmanuel (2006). "Existence result for a model of Proteus mirabilis swarm". Differential and Integral Equations. 19 (6): 697–720. arXiv: math.FA/0702761 . Gué, Michaël; Dupont, Virginie; Dufour, Alain; Sire, Olivier (2001). "Bacterial swarming: A biological time-resolved FTIR-ATR study of Proteus mirabilis swarm-cell differentiation". Biochemistry. 40 (39): 11938–45. doi:10.1021/bi010434m. PMID 11570895. Rauprich, O.; Matsushita, M.; Weijer, C. J.; Siegert, F.; Esipov, S. E.; Shapiro, J. A. (1 November 1996). "Periodic phenomena in Proteus mirabilis swarm colony development". Journal of Bacteriology. 178 (22): 6525–38. PMC 178539 . PMID 8932309. "Proteus mirabilis". NCBI Taxonomy Browser. 584.